The Guitar Teacher offers personal guitar tuition at his family home at 7 Browning Street, Grey Lynn. Because he teaches from home, he is set up only for personal one on one tuition. He is not set up for group lessons of three or more. From time to time he may do group teaching at purpose-built or community venues. A benefit for you of home based lessons is that tuition fees have been stable for nearly 30 years. For Grey Lynn residents, it's an easy walk to Browning Street. If you need to come by bus, you're in luck. There's a Westmere bus stop just round the corner of the top of the street on Surrey Crescent. Several buses stop two blocks away on Richmond Road. And four blocks away, at the Surrey Crescent, Williamson Avenue instersection, multitudes of West Auckland bound buses pass by there. As well as the regular Point Chevalier buses. 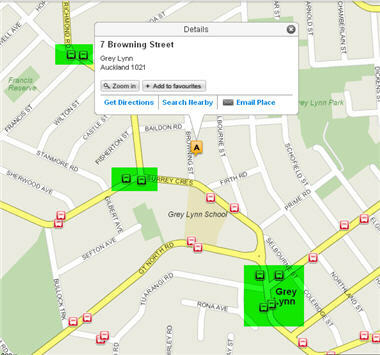 The green shaded Grey Lynn stop below offers you the most buses. Buses go through there every few minutes fron the West or the city. For motorway drivers, Browning Street is only seven blocks from the Western Springs off ramp on the North Western Motorway. This makes it easy for people from West and South Auckland to take advantage of guitar lessons at Browning Street. Drivers from the North Shore may also take this route. They have several more ways to reach Browning Street from the Harbour Bridge. Of course, motorway access is even better during offpeak hours. Many south Auckland parents and students have taken advantage of this. When you visit 7 Browning Street you will see no Guitar Teacher signage. There are no signs to tell you that you can have guitar lessons there. It's just a regular Grey Lynn villa. You'll just see a No 7 on the letterbox and a Red Door on the front porch with a brass knocker and stained glass windows. Which all tells you that you're in the right place. Please don't fall into the trap of confusing stained glass at shoulder height with a big brass knocker at hand height. It's seems to be easy to do. The stained glass panes in the door are beautiful and they are designed for decoration. The brass knocker is also beautiful and, unlike stained glass, it's especially built for knocking on and banging on. So when you come, bang confidently and loudly on the brass knocker. For a warm welcome to your be my guest lesson. Here's a Google Map to help. Notice how you can get directions from your house to 7 Browning Street with the Google map below? Simply click on the Get directions: To Here link. Nifty huh! Now that you know where to come, possibly all that's left to do is book your free Be My Guest Lesson.